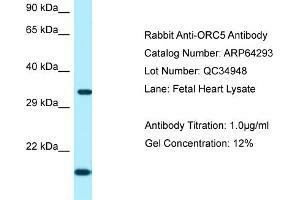 Characteristics This is a rabbit polyclonal antibody against ORC5. It was validated on Western Blot. Background The origin recognition complex (ORC) is a highly conserved six subunit protein complex essential for the initiation of the DNA replication in eukaryotic cells. Studies in yeast demonstrated that ORC binds specifically to origins of replication and serves as a platform for the assembly of additional initiation factors such as Cdc6 and Mcm proteins. The protein encoded by this gene is a subunit of the ORC complex. Alternatively spliced transcript variants encoding distinct isoforms have been described.